Leave the car if you like, because Lennox Holiday Apartments are right in the tranquil seaside village of Lennox Head and easy walking to shops, cafes, restaurants, boutiques and a great beachfront pub. Stroll along the pristine beach or scenic drive the spectacular northern NSW coastline stretching endlessly. 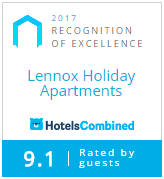 Lennox Holiday Apartments are tucked away in Lennox Head just 15 minutes scenic drive south of internationally acclaimed Byron Bay and 10 minutes north of the larger town of Ballina with its airport, supermarkets, cinemas, clubs and other facilities. By car: From Brisbane about 2 hours. From the Gold Coast about 1 hour. From Sydney approximately 10 hours. By air: Daily domestic flights into Ballina/Byron or Gold Coast Coolangatta with shuttle bus connections. Taxis, limousines and hire cars are also available. International carriers fly into Brisbane. Rail and bus services are also available from major centres. Office hours: Monday – Friday 9am – 5pm. Saturday & Sunday 9am – 12pm. Check in can be pre-arranged for any time after office hours by contacting management. For surfers, Lennox Point is world famous for its right-hand break (one of the biggest and longest in Australia), or for the rest of us, just up the road are the calm waters of Lake Ainsworth freshwater tea-tree lake; the perfect setting for lazy swimming or canoeing. And don’t forget our large variety of quality restaurants and cafes. Or you can forget all that and just take a hat and towel down to the beach for the day. Lennox Holiday Apartments – the perfect place to relax.